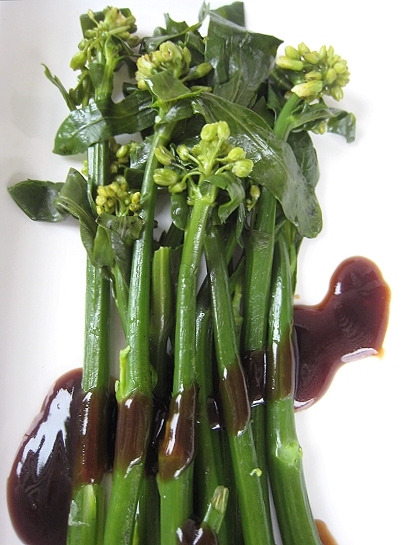 For some reason, we never used to cook gailan (Chinese broccoli) at home. I used to find them a tad bitter. But, I started thinking of them more favorably when I discovered that the "crunchy" discs that I like so much in some versions of fried rice were actually thinly-sliced gailan! Recently, after years of never seeing gailan at home, we had some in the house. The task fell to me to cook it. Having no ideas on what to do with them, I looked to the classic way they're served in Cantonese restaurants: simply boiled with oyster sauce. I did quick research via a Martin Yan cookbook and discovered that the sauce is actually a blend of oyster sauce and sesame oil. So, I prepped the gailan by peeling off the tough "skin" near the bottom of the stalks, much like prepping asparagus, then boiled it. It was finished with a drizzle of the oyster sauce-sesame oil mixture. I tasted it and guess what? They weren't bitter at all! And that sauce! I know I shouldn't be surprised seeing as I'm not a stranger to oyster sauce. I guess you can say I re-discovered it. That sauce was so good. Not bad for a 3-ingredient dish, eh. After that successful dish, I kept seeing gailan more and more often in the refrigerator. The next time I made it, I remembered the sasagaki cutting technique I saw in Jude's Kinpira Gobo dish. Well, I started cutting the gailan stalks like I was sharpening a pencil, then realized halfway through that it was easier just to cut them in diagonals. I heated some oil in a pan, then added some garlic. The gailan went in next, followed by oyster sauce and some sesame oil. When the gailan was done, I simply added a little cornstarch slurry (cornstarch dissolved in cold water) to thicken the liquid in the pan. 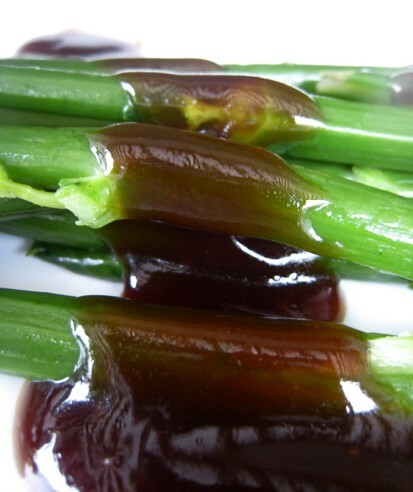 Everytime gailan appears in the fridge, I am called to cook it. JS jokes that I've become a gailan stir-fry "expert." For your holiday get-togethers, why not make Way #1? It's as simple as simple can be. 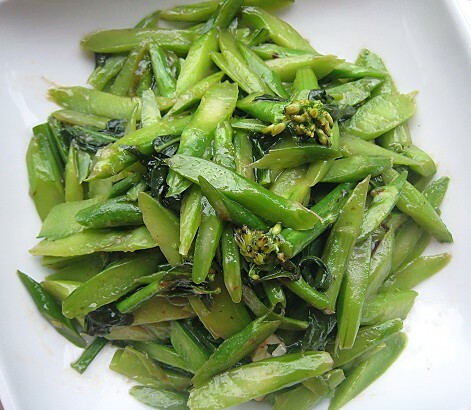 You can blanch the gailan in advance until it's cooked but still "crunchy". When you finally need them, a stint in the microwave is all they need. Or, you can serve them at room temperature. They look very elegant arranged on a platter with the oyster sauce-sesame oil mixture spooned over them. You can't beat the simplicity of three ingredients! If you'd like to participate, see who's hosting next week. WHB is hosted this week by Haalo herself! One of my favorite veggies & such great ways to serve it! Gailan is also one of my favourites and I'll buy it whenever I see it. Thanks for sharing these ideas! I thought the dimsum places I go to only put oyster sauce on their gailan, that's why I couldn't quite replicate the flavor at home. Now I know to put sesame oil. And the second way sounds good, too! Love garlic. 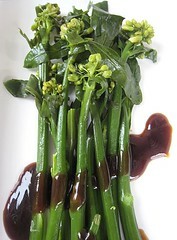 Mmm - this is one of my fave Chinese veggies. Looks delicious and both are prepared well! I really love the lighting on these photographs. I've heard of this before but never had it. 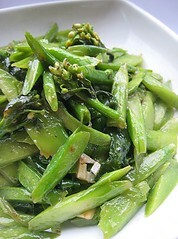 These are my favourite ways to have Gailan (or most Chinese vegetables for that matter). Thanks! They were taken in natural light. Beautiful dishes - I'm quite partial to the look of the sliced version, I could easily start tucking into that! Thanks. Hmm, it's been a while since we've had stir-fired gailan. Stir fry with garlic, ginger root, salt, sugar, and then add some Chinese sweet vinegar. Oh, I've never had it with the sweet vinegar. Will try that.